"The true story of an American ninja." 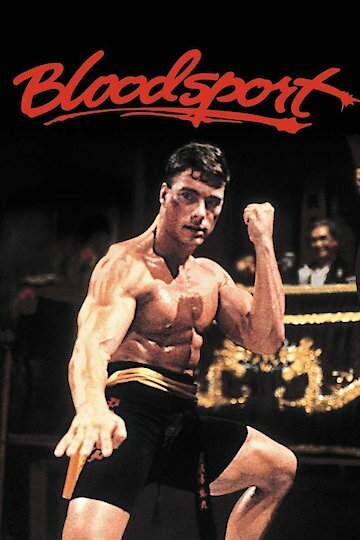 Bloodsport is an action martial arts film that came out in the late 1980’s. It is about a Westerner named Frank Dux who enters an underground martial arts tournament. He is able to win the tournament and become the first champion from a Western nation. Over the course of the film he defeats a number of tough opponents including the defending champion. Viewers are able to check out a number of different fighters and witness varying fighting styles. The movie has Jean Claude Van Damme as this was one of his earliest projects. In the beginning of the movie preparations for the upcoming tournament is being done. At the same time many of the participants are training and making their final preparations before they depart to Hong Kong to compete. One of the participants named Frank Dux is a Captain in the Army and is requested by a subordinate to talk to his commander. It turns out that the commander disapproves of him going to fight in a tournament. Dux then goes to visit his master who trained him years ago. While Dux waits to see his master he begins having flashbacks of his past. In the flashback he is a teenager who breaks into the home with friends to steal a sword. However he looks to put it back and not steal it. Unfortunately the son of the homeowner kicks him and the homeowner named Tanaka tells him he won’t get the authorities involved as long as he agrees to train in marital arts. Later on the son goes to Vietnam and dies and Dux requests to be trained by Tanaka in advanced martial arts. Dux gets through the training and becomes a master. After the flashback Dux meets with his master and tells him he is going to Hong Kong to honor him by competing in the tournament. In Hong Kong Dux befriends a fellow American named Ray Jackson. They compete in the tournament and succeed by defeating their opponents. However Jackson loses to the defending champion named Chon Li. Dux avenges his friends defeat by beating Chon Li in the final match. Dux is awarded a sword to honor his master and leaves Hong Kong. Bloodsport is currently available to watch and stream, download, buy, rent on demand at Amazon Prime, Starz, Vudu, FandangoNow, Google Play, iTunes, YouTube VOD online.